The Three Valve Drip Kit is a special version of the Drip Kit made to support three independent water valves. Each of the three valves can be programmed to have a different drop size, and the time between each drop can be independently set. 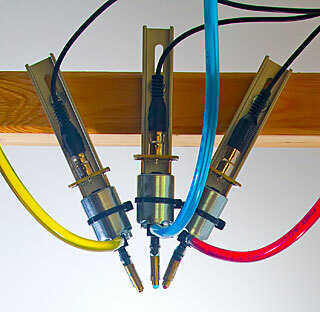 This allows maximum flexibility with compound collisions and multi-colored drops. When you enter the Drop Mode settings, the value for "Drop Size 1" applies to the first valve. The value for "Drop Size 2" applies to the second valve. The value for "Drop Size 3" applies to the third valve. 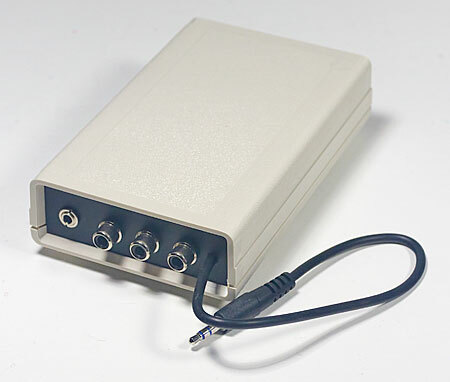 A toggle switch on the back of the box also allows you to set the Three Valve Drip Kit to fire all three valves at the same time instead of one after the other. Using three water valves is not easy. Most people will probably be content with the standard single valve Drip Kit. But for those who want maximum control for serious experimentation, this will do it. Shown here is a sample setup for three valves. 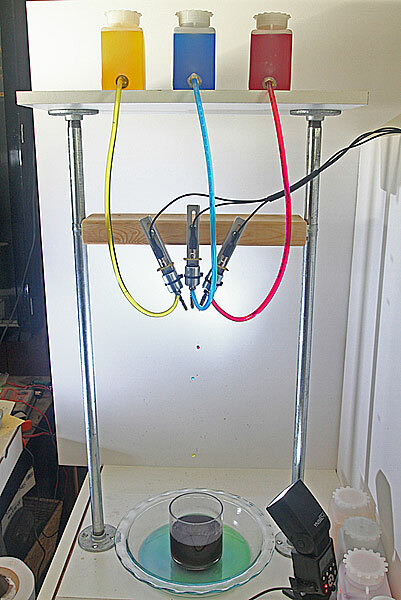 This rig was made from 1/2" pipe fittings, shelf boards, and a piece of 2 x 4. You will need to build some sort of structure to support the valves and bottles. This is just one inexpensive possibility. The three bottles of drip fluids sit on a shelf at the top. These feed through clear tubing to the valves themselves, mounted to a 2 x 4 that can slide up or down on the 1/2" pipes. The valve brackets (included with the Drip Kit) can be screwed to this 2 x 4 and arranged as you wish. But this is the difficulty of multiple valve water drops. If you want the drops to land in the same place you have to take the time to create this alignment. The valve in the center falls straight down. The side valves must be arranged so their drops project a little to land in the same spot. This takes some effort. 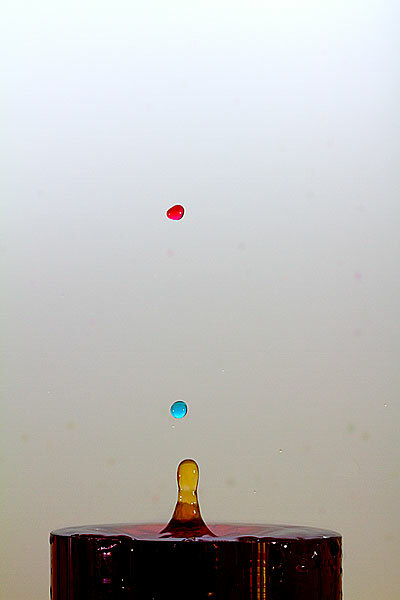 If all is well you will get three drop collisions of different colors under individual control. The Three Valve Drip Kit can be ordered with one, two, or three valves. This allows you to build a system gradually, learning with a single valve (or two), but leaving open the option of using three valves if you decide to go that far. The Three Valve Drip Kit works just like the standard Drip Kit if you only use one valve. But it can be expanded later by adding more valves.